1868 marked the inception of the Benevolent and Protective Order of Elks. The organization quickly began to charter lodges across the country. On July 12, 1900 eighty men who represented banking, business, profession and laboring people organized the 580th Lodge in Millville, NJ. Today, we find the lodge an important asset to our community, an organization comprised of over 800 men and women with a common mission: To inculcate the principles of Charity, Justice, Brotherly Love and Fidelity; to recognize a belief in God; to promote the welfare and enhance the happiness of its Members; to quicken the spirit of American patriotism; to cultivate good fellowship; to perpetuate itself as a fraternal organization, and to provide for its government. The Benevolent and Protective Order of Elks of the United States of America will serve the people and communities through benevolent programs, demonstrating that Elks Care and Elks Share. The original meeting hall of the lodge comprised the second and third floors of the Giuffra Building on 112 North High Street. The second floor was equipped with recreational facilities while the third floor was used for meetings. Weeks, when meetings were not scheduled, the lodge sponsored many successful dances in the meeting room. In 1909 the lodge members voted to purchase the former Councilor Building on 22 E. Vine Street. The building was renovated and became home for Lodge 580. In 1949, the lodge erected an addition at the rear of the home and installed modern equipment for social activities. It marked one of the largest advancements since the purchase of the home. 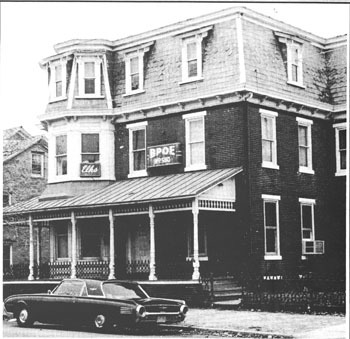 In 1971 the Millville Elks moved their Lodge to the present location on 1815 E Broad St. Three years after we built our new home we had a mortgage burning ceremony. The Millville Lodge became one of the community leaders in all-civic affairs. From 1920 until his death in 1949 the late Eugene Gallaher headed our Lodge’s Crippled Kiddies Committee. It was his planning and hard work, with the full cooperation of professional men of this city, St. Francis Hospital, Trenton, and Philadelphia hospitals that made this committee one of importance to the community. This tradition is still carried on today as Lodge #580 continues to provide for physically challenged children. Names of individuals aided by the Lodge, and the financial assistance granted, has never been revealed by the Order but the Community realizes that the Elks have been a major benefactor to Millville and surrounding communities. Throughout the twenty century, the Lodge has sponsored many events, including Horse Shows, Family Pictures, Baseballs Games, Wrestling Shows, children’s outings in Wildwood and many other activities to raise the necessary funds to benefit the community. Pictured here is the Elks Jazz Band performing at a dance in the 1920's. WAR SERVICE WORK During World War II, Millville Lodge of Elks launched its own committee for War Service Work. The Lodge was open to service men and enlisted officers from the Millville Army Air Base and the committee saw that visiting servicemen enjoyed themselves during their stay in Millville. A special Rehabilitation Fund was set aside by the Lodge to aid soldiers in rehabilitating themselves upon being discharged. Loans were made to applicants without interest. As a monthly service, the committee saw that care packages were sent to members entering the armed forces and when their addresses were not known, a sum was placed in a separate fund for each serviceman. The Lodge contributed freely, both in time and finances, to the Selected Community Committee Parties in honor of those being called into service. Other war activities included monthly contributions to the State Association and Grand Lodge towards war work. ORGANIZATION OF THE VINELAND LODGE In 1922 Millville Lodge was asked to organize the Vineland Lodge of Elks. A total of 42 members at the Lodge, who resided in Vineland, were transferred at a dinner meeting held in Vineland. Millville Officers organized this new South Jersey Elks Lodge. Stacey N. Wean was Exalted Ruler in 1922 and with the assistance of other officers and members conducted the organization service and presented the charter to the Vineland Lodge. FEMALE ELKS In 1935, under the lead of Dr. Muriel Ramsey, 13 charter members formed Millville Lady Elks. The Lady Elks thrived for decades, actively raising funds for community service. They eventually merged with the main organization. In April of 1997, Judi May was indoctrinated as the first women member of Millville B.P.O.E. Lodge 580. Nine years later, Beverly McFadden became the first female Exalted Ruler. ELKS QUARTETTE The Millville Elks had one of the finest quartettes in the State. It was organized March 6, 1946 with the four men giving freely of their services to the Lodge whenever called upon. The quartette had been in demand throughout Cumberland County and entertained at some of the largest gatherings and top events in South Jersey. The men, by mutual consent, restricted their singing engagements to twenty-five per year. Members were: Earl Breslin, first tenor; Russell Pettit, second tenor; Russell Hufsey; baritone, and Sheppard Hogan, bass. SPONSORED SCHOLARSHIPS For several decades, the Millville Lodge has sponsored the scholarship of the Grand Lodge National Foundation. The pupils of Millville High School have been offered the privilege of entering the National competition for the worthwhile scholarships. We proudly announced that several students from New Jersey have won scholarships from the National Foundation. OTHER ACTIVITIES Since the late 1940s, the Millville Lodge has sponsored Sport Frolic Night. The purpose of this affair is to gather together sports enthusiasts, coaches and officials. This event has been annually hosted by the lodge for the past 60 years. The members have participated in shuffleboard and dart tournaments both in the city league and inter-club leagues. LODGE HONORS Members of the Millville Lodge have been chosen to serve as State and Grand Lodge Officers. Bloomfield Phrampus, Past Exalted Ruler has served as District Deputy Grand Exalted Ruler, and as Vice President, New Jersey South. In addition, he served on the State Paraplegic Committee and the State Crippled Kiddies Committee. Robert J. Gillespie, Dr. served a term as District Deputy Grand Exalted Ruler. Our Lodge fairs well in competitions with other lodges. In the 2007 Ritual Contest, The New Jersey State Elks Association presented Millville Lodge #580 with: Best Exalted Ruler - Bill Meischke Best Esquire Chair - Carl Haserick All-Star Ritual Team - Carl Haserick 2nd Place - Best Lodge Overall The New Jersey State Elks Association also presented Millville Lodge #580 with the following awards at the 2007 New Jersey State Elks Convention in Wildwood, NJ. 1st Place - Best Float for a lodge with 501 members and above. 3rd Place - Best Overall for a lodge with 501 members and above. 5th Place - Best Lodge Marching for a lodge with 501 members and above. The South District of New Jersey State Elks Association presented Millville Lodge #580 with the following awards at the 2007 New Jersey State Elks Convention in Wildwood, NJ. 1st Place - Best Lodge Marching 2nd Place - Best Esquire 3rd Place - Best Overall 3rd Place - Best Appearance 3rd Place - Best Float LODGE OF TODAY In the past 110 years 89 Elks have served the role of our Exalted Ruler. For over a century, the Millville Elks Lodge continues to be a strong force in the community. Our philanthropic nature has constantly helped to bolster our community. We regularly donate time and money to worthy local causes. Each year will sponsor events to honor our veterans, guide our youth and help the less fortunate. Each day we strive to live our mantra, Elks Care – Elks Share. Exalted Rulers 1900 1902 Joseph D. Troth 1902 1903 Martin Lane 1903 1904 J. E. Nixon 1904 1905 D. H. Masters 1905 1906 Claude B. Smith 1906 1907 Albert M. Pitcher 1907 1908 George A. Peacock 1908 1909 Ralph Barber, Jr. 1909 1910 Claude Reeves 1910 1911 Clarence W. Sockwell 1911 1913 Albert Davis 1913 1914 Joseph D. Needham 1914 1915 Martin V. Chapman 1915 1916 Ralph R. Charlesworth, Jr. 1916 1917 Thomas S. Garton 1917 1918 Robert J. Gillespie, Sr. 1918 1919 Guy G. Fisher 1919 1920 William F. Kell 1920 1921 Wilbert Sheldon 1921 1922 Harry C. Kates 1922 1923 Stacy N. Ewan 1923 1924 William Charlesworth 1924 1925 Jesse DeBois 1925 1927 Leroy Wood 1927 1928 Harry E. Lloyd 1928 1930 Jack Thornborrow 1930 1931 John McFarland 1931 1932 Cyril McCorristin 1932 1934 Emil Enzman 1934 1935 Charles Lynn 1935 1936 Fred Klawitter 1936 1937 Harold Dunham 1937 1938 August H. Bahr 1938 1939 Alex Muehler 1939 1940 Basil King 1940 1941 William Schmickle 1941 1942 Bloomfield Phrampus 1942 1943 Firman Robinson 1943 1944 Edward G. Bevan 1944 1945 Glenn Somes 1945 1946 Harry Beebe, Jr. 1946 1947 William S. Gravel 1947 1948 Harlan Hogan 1948 1949 Walter Konschak 1949 1950 Channon McCaw 1950 1951 Earl Breslin 1951 1952 C. Dean Ewen 1952 1953 Carmen G. Jones 1953 1954 Joseph Yeager 1954 1955 Alex Muehler 1955 1956 Ambrose Clark 1956 1957 Raymond Clark 1957 1958 C. Dean Ewen 1958 1959 Joseph Loteck Sr. 1959 1960 John T. Husokowski 1960 1961 William L. Hogan 1961 1962 John A. Myers 1962 1963 Charles B. Fisher 1963 1964 John A. Myers 1964 1965 John Cheeseman 1965 1966 Asher Millard Sr. 1966 1967 Jesse H. Smith Sr. 1967 1968 J. Malcolm Beebe 1968 1969 Thomas Beebe 1969 1970 Joseph J. Lynch 1970 1971 John T. Eller 1971 1972 Robert Keen 1972 1973 J. Malcolm Beebe 1973 1974 Paul Quinn 1974 1975 Donald R. Soltys 1975 1976 Michael Quinn 1976 1977 Donald R. Soltys 1977 1978 John T. Eller 1978 1980 Nicholas Hinds 1980 1981 Franke H. Lord 1981 1982 James McDonough 1982 1983 John T. Eller 1983 1984 Charles Eller 1984 1985 Leo Ferus, Jr. 1985 1986 Wayne Sergiacomi 1986 1987 Gustav Hughes 1987 1988 Malcolm Beebe 1988 1989 Leo J. Ferus, Jr. 1989 1990 Wayne Sergiacomi 1990 1991 Melvin Marshall 1991 1992 George Carty 1992 1993 Bob Hayes 1993 1994 Marvin White 1994 1995 David Parkhill 1995 1996 William Meischke 1996 1997 David S. Carman 1997 1998 Gary Cheeseman 1998 1999 George Carty 1999 2000 David Parkhill 2000 2001 Byron J. White 2001 2002 Dane Bingham 2002 2003 Ralph Trout 2003 2004 Bill Riley 2004 2005 Ralph Trout 2005 2006 Bob Moore 2006 2007 Beverly McFadden 2007 2008 Bill Meischke 2008 2009 Bill Meischke 2009 2010 Vicki Watson 2010 2011 Kevin Smith 2011 2012 Kurt Haserick 2012 2013 Beverly McFadden 2013 2014 Henry Taylor Lady Elks Charter Members Dr. Ramsey, Bertha Lober, Elizabeth Enzman, Helen Garton, Betty Baumohl, Anna Lehman, Sadie Peterson, Mary Corson, Linnie Muehler, Henrietta Errickson, Carrie Webster, Etta Smith and Winnie Nessen. First officers of the Lady Elks were: Dr. Muriel Ramsey, president; Elizabeth Enzman, Leading Lady; Linnie Muehler, Loyal Lady, Winnie Nessen, Lecturing Lady; Mary Corson, Tiler, Bertha Lober, Recording Secretary; Betty Baumohl, Corresponding Secretary; Anna Lehman, Treasurer and Carrie Webster, Sadie Peterson and Helen Garton, Trustees.